My quest to get my arms around Oakland’s serpentinite patch took me to the grounds of Merritt College, where a long tentacle of this rock is mapped. It’s a complicated area, and the topography on the ground no longer matches what’s shown in the geologic map. Long story short (or in the new hip lingo, “tl;dr”), I think it’s best to show the Google Map map first, with the outline of the tentacle superimposed on it. I’ll show photos from the four numbered locations. And then here’s the geologic map of the same area. 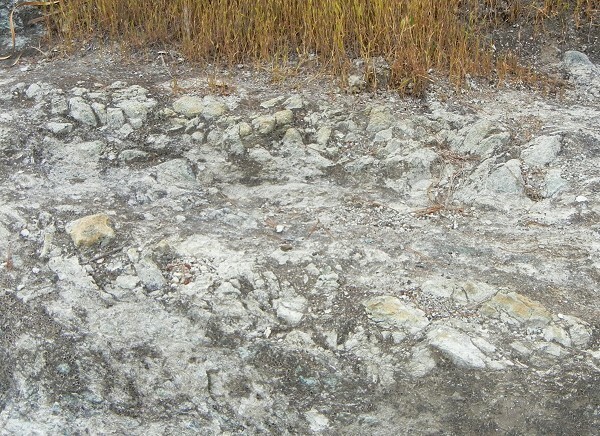 Remember that most of Oakland’s rocks have been shoved around, crumpled, sliced by a major fault and tilted on end. It’s OK if the map doesn’t make sense. Here’s the overall scene looking northwest from hill 1175. (Do the locals have a name for this hill? I need to know.) Redwood Peak in the background. 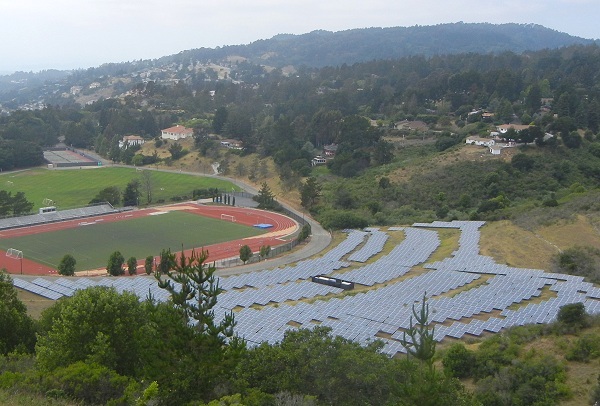 Two ballfields and a solar array have wiped out the earlier contours of the land, which was previously a rock quarry. The road skirting the two ballfields is cut into the serpentinite. The first locality is that light-colored patch behind the six sentinel trees. And here it is. 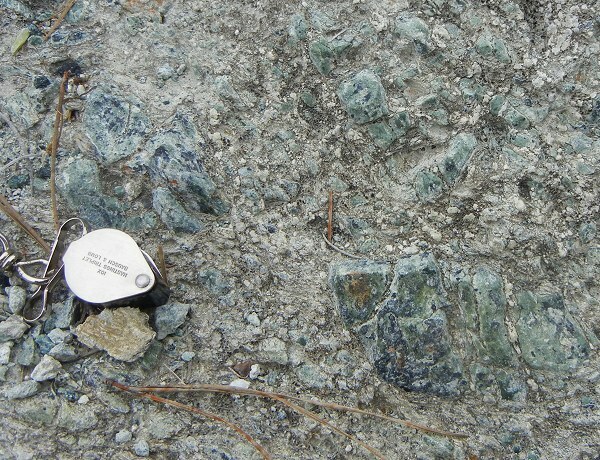 This is a very informative exposure showing a clear contact between the serpentinite and the adjoining shaly rocks of the Knoxville Formation (KJk). 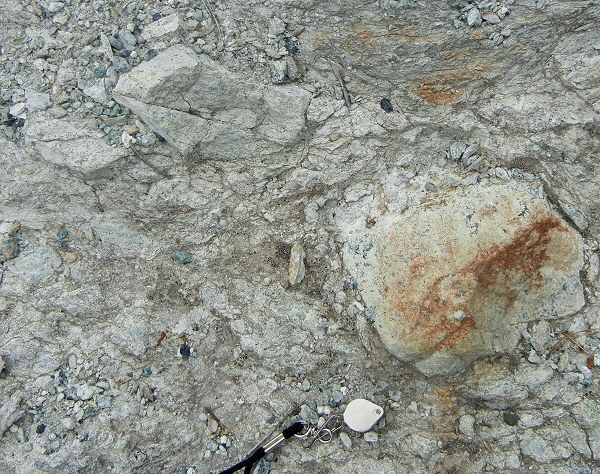 I think this is the key locality that led to this contact being interpreted as a thrust fault (signified by the black triangles, “teeth on upthrown side”). I’ll show you the evidence. First, here’s a look uphill along that contact, at the front edge of the exposure. The rock along the contact is dark, hard and altered. 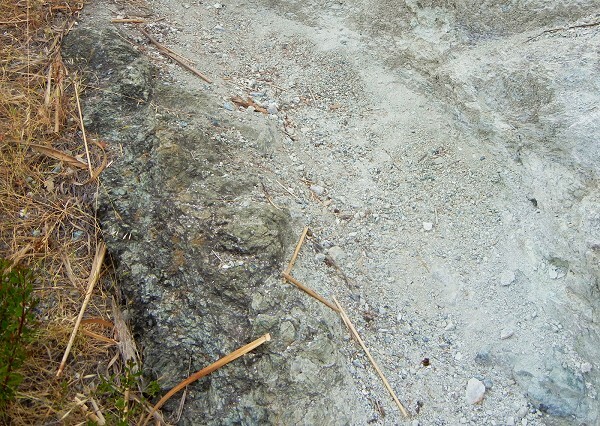 Farther uphill, the serpentinite is thoroughly shatteredbrecciated. The shock and shifting due to earthquakes, many thousands of them, would do this, just as they cracked the Oakland Conglomerate. The next three shots show the breccia at ever-closer range. 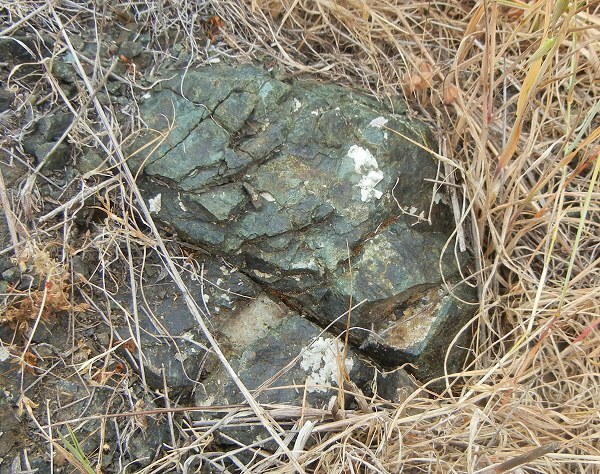 There are lovely blue-green pebbles of the original serpentinite floating in this broken matrix. 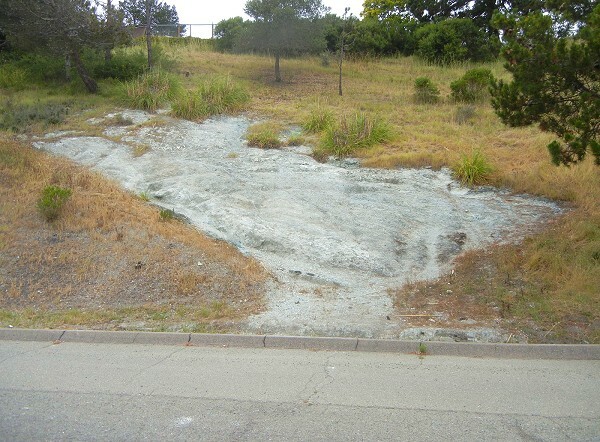 The map’s author, Russ Graymer, interpreted this contact as a thrust fault because that’s practically the default in the East Bay hills, which have been compressed from the west for several million years and counting. He also surely noted that outside the contact zone there’s no sign of heat or chemically active fluids associated with the brecciation. That points to cool conditions near the Earth’s surface rather than some truly ancient activity when these rocks were more deeply buried. So during the recent geologic past, as our hills were being pushed upward, the serpentinite rode up relative to the Knoxville Formation mudstone, sliding on the surface between them. 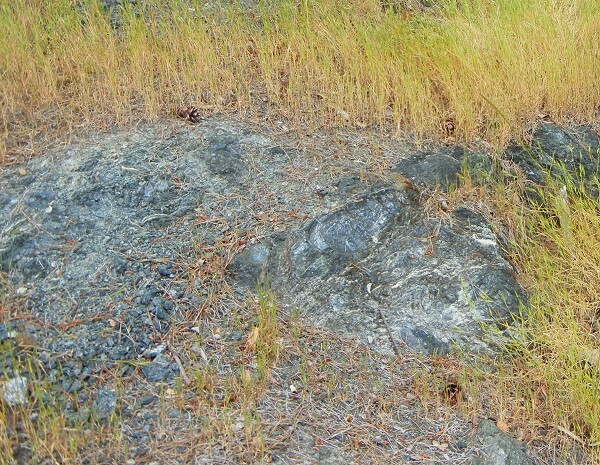 The whole roadcut, wherever the rock peeks out through the grass, is serpentinite. Farther along the road is this darker example. It’s full of swirly detail and veins of white mineral, probably calcite, that attest to hotter deep-seated activity. That’s an older story not related to the recent thrusting. Beyond the roadcut a stream valley full of thick brush cuts through, hiding any more rock. And beyond that the ground beneath the solar array is untrustworthy, because such things are usually set upon beds of imported gravel. But on the other side, where bedrock is exposed again, there is enough dark serpentinite to justify drawing the map as Graymer did. 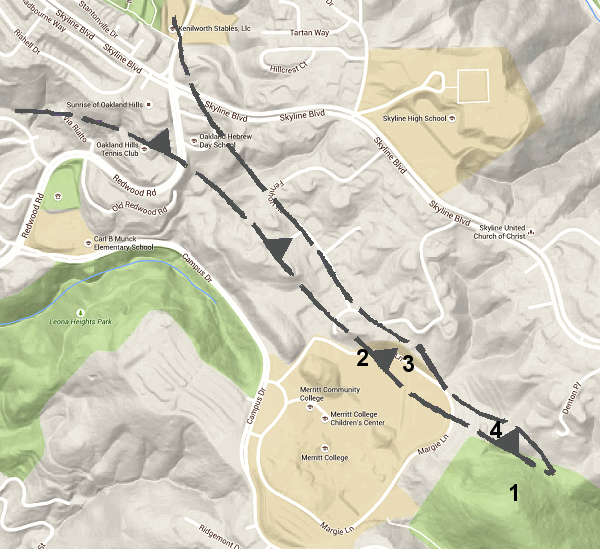 Next I want to trace out the uphill edge of the tentacle, which is conveniently mapped right along Fernhoff Road. Some other time. By the way I’m finally going to subdivide the “Oakland rocks” category into a hierarchy. After nearly 8 years of this blog I’ve tagged 140 posts with that label, which is silly. This entry was posted on 1 June 2015 at 8:02 am and is filed under Oakland serpentinite, Old quarries. You can follow any responses to this entry through the RSS 2.0 feed. You can skip to the end and leave a response. Pinging is currently not allowed.